Vision: How you envision your Grange in the community; your dream. Strategy: What you are going to do to achieve your vision. Tactics: How you will achieve your strategy and when. Vision is your members dreams of what the Grange strives to be within your community. Strategy is the large-scale plan your Grange will follow to make that dream happen. Tactics are the specific actions your members will take to follow the plan. Start with the vision and work down to the tactics as you plan for the future of your Grange. Whether you are planning for the next month or the next five years, the concepts are the same. Only the scale is different. You start with the vision statement (sometimes called a mission statement). When you know what the vision is, you can develop a strategy to get you to the vision. When you have decided on a strategy, you can then develop tactics to meet the strategy. A vision is an idea -- what the Grange should be, and how it will fit into it's surroundings (community). Often the vision reflects the combined dreams of the members, as well as following the path set forth by the founders of the organization. Your Grange's vision could be, for example, to be "an organization that helps the underprivileged in the community," "the voice of community concerns and liaison to the State Government," or "setting an example for other non-profit organizations in the community." A vision must be sufficiently clear and concise that everyone in the organization understands it and can buy into it with passion. Your strategy is one or more plans that you will use to achieve your vision. To be "the voice of community concerns and liaison to the State Government" you might have to decide whether it is a better strategy for you to hold town forums and meetings at your Grange Hall, try to canvas the community for their thoughts and opinions, or a combination of both. A strategy looks inward at the organization, but it also looks outward at the environment and community climate. To be "setting an example for other non-profit organizations in the community" your strategy would need to evaluate what other organizations offer in community services, which of those target your audience, and which organizations could in the future benefit from the Grange's services. Your strategy also must determine how you will become "the organization of choice." What can your members do so that your targeted audience chooses your Grange? Are you going to offer the most benefits to the community? Will you participate in community events, such as the local parade or fair/festival? Will you recruit the very best people and build a reputation for delivering the most innovative solutions? What makes your Grange stand out? If you decide to make a statement in your community, what will you do to attract new members, and then encourage them to participate once they join? If you decide to recruit the best new people, how will you enlighten them, and retain them? Your strategy must consider all these issues and more to find a solution that works AND that is true to your vision. Your tactics are the specific actions, sequences of actions, and schedules you will use to fulfill your strategy. If you have more than one strategy you will have different tactics for each. A strategy such as "to be a well-known local organization," as part of your vision to be "setting an example for other non-profit organizations in the Community" might involve tactics like advertising in the Non-Profits Quarterly Newsletter for three successive issues, placing brochures in the town tourism center, advertising in the largest-circulation newspaper in the area for the next six months, hanging posters at the local grocery store, having a booth at the "Taste of the Town" festival, having a float in the Memorial Day Parade, or even buying TV time on the popular TV station or radio station in the area to promote your community services. It could even be as simple as a bake sale at the local supermarket. Or it could involve sending a letter of introduction and a brochure to the Executive Director of every non-profit organization, chamber of commerce, and giving foundation in the area. Things change. Your Grange needs to change with them, or if possible, ahead of them. However, with respect to vision, strategy and tactics, you need some flexibility and some firmness. Hold to your Grange's dream/vision. Don't let that be buffeted by the winds of change. Your vision should be the anchor that holds all the rest together. Strategy is a longer-term plan, so it may need to change in response to internal or external changes, but strategy changes should only happen with considerable thought. Changes to strategy also should not happen until your Grange has a new one to replace the old one. Tactics are the most flexible. If some tactic isn't working, adjust it and try again. Whether for one department or the entire Grange, vision, strategy, and tactics are essential. Develop the vision first and hold to it. Develop a strategy to achieve your vision and change it as you have to, to meet internal or external changes. Develop flexible tactics that can move your Grange towards fulfilling your strategy and ultimately vision. The next time you feel overwhelmed by a big project, make it easy on yourself by approaching it this way: little by little by little. Years ago I volunteered to be in charge of the refreshments at church. My job was to recruit 48 people every month to bake a cake or bring some cookies. I struggled to recruit that many volunteers and it quickly became overwhelming. To make it worse, as my overwhelm grew, fewer and fewer people volunteered to help. People began to run away when they saw me coming. So, I gave up recruiting and tried to bake most of the goodies myself. This was a huge task and I quickly burned out and resigned. My successor was Sue King, a social worker. I watched in amazement as within two weeks she had enlisted 48 volunteers. This is how she did it: She broke it down into little steps. Instead of recruiting all 48 people herself, she recruited eight team captains who were willing to be in charge once a month. They each recruited six people who would donate one refreshment a month. When I was in charge, I was begrudgingly doing everything. Under this plan, more than 48 people were happily participating. One of the secrets of Sue's success was that, unknowingly, she applied the principle of To Lead is to Serve. Sue continually served the team captains. If a captain could not find six people, she helped recruit them. Since she was not baking everything herself, she had time to meet people and ask if they would like to participate. She constantly made the team captains feel that she was supporting them. Another secret of Sue King's success was dividing the work into small increments. I was trying to recruit 48 people. Sue was only looking for eight. Nehemiah rebuilt the wall of Jerusalem in the same way. The wall around the city was its major protection. Today, a wall is not a primary defense system but in Nehemiah's day, a wall was central to the city's safety. Rebuilding it was such a huge task that most people thought it couldn't be done. However, Nehemiah saw it another way. He divided the task into tiny sections, asking each person to be responsible for a small portion. Everyone did a little. In this way, a huge task was accomplished quickly. While reading about Nehemiah rebuilding the wall, I could envision each group doing its part with great enthusiasm. It reminded me of my refreshments project and others I have worked on. They are more successful when a lot of people do a little, as opposed to one or two people doing everything. The next time you face a project that seems big and overwhelming, divide your work into small steps. Make it easy by doing it this way: little by little by little. 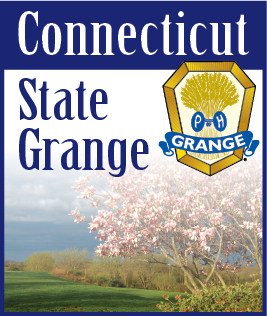 One day of State Grange session is largely devoted to the Youth and Junior members of the Grange. Being a family oriented organization, the children have their time of recognition as well as the adults. Children from five to fourteen may be members of the Junior Grange, learning to fill the position of the various offices and participating in many fine projects. The flag bearer this year was a very serious five year old girl who presented the [junior size] flag with great dignity and care. Each of the youth and junior members learn to assume their place of importance in the group, thus gathering a sense of self worth that is so important to our youth. I couldn't help but reflect on the problems that we witness in our nation today, as many children are neglected, abused and drawn into wrong activities. Many are never given an opportunity to become part of a group that really cares for their well being. Most of us realize that solid moral values are of great importance and need to be taught at an early age. We can see where many of our rural organizations have become the training school for many of the leaders of our nation. The programs and projects taught by the leaders of the Grange, 4-H clubs, FFA and Boy and Girl Scouts have lasting influence over the years. They have helped to mold the desirable character traits and ideals that become basic for life. Honesty, the dignity of labor, the importance of doing work well and learning to cooperate with others in a group, all help our children throughout their years of schooling and on into work and family situations. Although some persons have looked down on those who till the soil and raise livestock, agriculture has become one of the most diversified and demanding occupations of any. A farmer or rancher must be informed on hundreds of topics if he is to succeed today. Farm youth truly grow up with many advantages that urban and suburban youth do not have. The livestock and dairy projects in which many farm youth participate have helped open the door to many life-long occupations, some of which are off the farm. Skills and confidence are developed growing up on a farm that are useful throughout life.